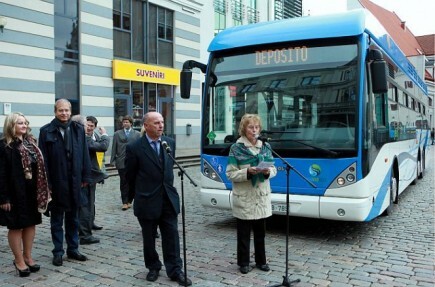 On 16 October there was for the first time in the Baltic States the opportunity to get acquainted with hydrogen car, Hyundai ix35 FCEV, and the hydrogen bus, Van Hool A330 FC, during Riga Energy Days and the 11th Open Days of European Regions and Cities, at the Riga City Council’s premises and the town square. The event was supported by HyER. The event opened at the Riga City Council Chamber, where everyone was invited to the presentations of international guest speakers (from Sweden, United Kingdom and Germany) who shared information on the integration of hydrogen transport in urban transportation systems. The conference attracted representatives of the municipality of Riga, regional partners of the Riga Energy Agency, partners of the Latvian Hydrogen Association and scientists of the National Research Program, LATENERG. Please find attached the agendas of the event on 16 October here and of 17 October. On 16 october, after the presentations, it was time to go to the Town square to see the vehicles in action. High level local policy makers along with citizens participated in the vehicles demonstrations: Riga Vice Mayor, Andris Ameriks, Vadim Barannik, chairman of Riga’s Traffic and Transport Committee, Leon Bemhens, Chairman of the Riga Traffic and the Executive director of Riga City, Juris Radzevics. It was the occasion for Van Hool NV representative, Luc Verstraeten, to perform a test run of the hydrogen bus on the streets of Riga. You can watch a video of the event, with interview in latvian of Mr Aivars Starikovs, member of the Riga City Council, Hydrogen and FC Advisory Board). On it’s way back, the FC bus stopped at the city of Liepaja, where citizens could get information about hydrogen technologies.